Knights on the Modena Archivolt, Italy, 1120-1140AD. Click on the figures for larger details. A larger image of the Knights on the Modena Archivolt, Italy, 1120-1140AD. 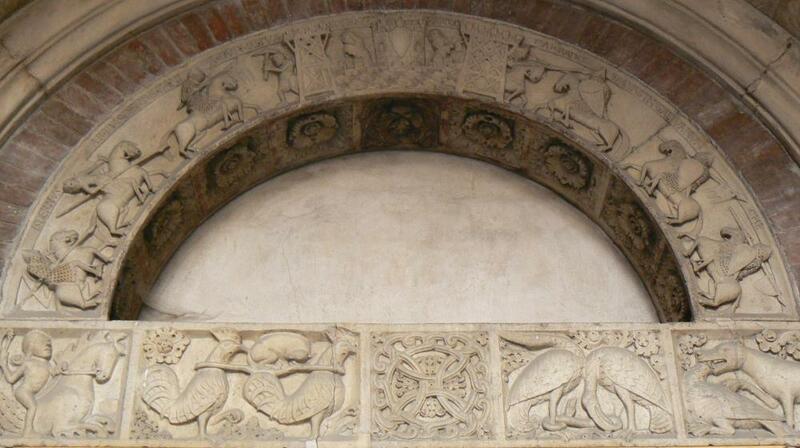 The Modena Archivolt is a sculpture carved over the Porta della Pescheria, the north portal of the Cathedral of Modena in northern Italy. This seems to be a version of the story of the rescue of Guinevere, told in Caradoc on Llancarfan’s Life of St. Gildas, Ulrich von Zatzikhoven’s Lanzelet and Chrétien de Troyes’ The Knight of the Cart. This means that it is roughly contemporary with Geoffrey of Monmouth and Caradoc of Llancarfan, but so geographically separate as to be almost certainly independent of them. It depicts an attack on the castle by a number of knights of the round table, on horseback, in order to rescue Winlogee (Guinevere) who is held prisoner by Mardoc (Meleagant). Construction of the cathedral began in 1099, though the sculpture can probably be dated to 1120-1140. An armoured Italian knight with kite shield and couched lance. The castle: Burmaldus, wielding a pick-axe, emerges to the left. Winlogee (Guinevere) and Mardoc (Meleagant). Carrado, on horseback, emerging to the right. Che (Kay) and Galvaginus (Gawain). A knight c.1100 in Armies of Feudal Europe 1066-1300 by Ian Heath, based on the Modena ArchivoltKnights on the Modena Archivolt, Italy, 1120-1140AD.